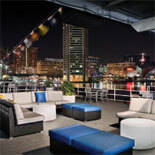 Conveniently located within walking distance of major hotels, attractions and the Convention Center, the newly renovated Spirit of Baltimore is an entertaining venue for a festive weekend night on the water. The lights of the skyline and historic landmarks create an idyllic background as the voyage follows the Patapsco River under a canopy of lights created by the moon and stars. You can enjoy the mesmerizing sights and the savory buffet as well as the attention to detail and the professional service that keeps the evening running smoothly. 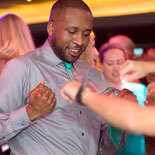 After dinner, DJs will play hits from a variety of musical genres. The on-board entertainment features music from the 1940s until the present. Wait staff often entertain guests with their vocal talents. 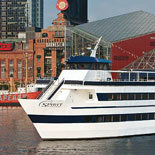 The Spirit of Baltimore has two fully enclosed climate controlled decks for year round cruises. The contemporary decor includes rich colors and textures as well as architectural details like sconces, wall-to-wall carpet, a spacious open floor plan and remodeled bars. The open-air observation deck provides marvelous views of the city and its historic harbor. 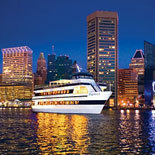 Handicap accessible, the Spirit of Baltimore provides the ideal venue for a fun and exciting evening that will impress even those with the most discriminating taste. A local harbor cruise is an unforgettable way to propose or celebrate a romantic occasion like a birthday or an anniversary. To create a cherished memorable evening beneath the stars, call today for an eTicket that will reserve a space on the next Spirit of Baltimore Weekend Dinner Cruise. Fridays and Saturdays : Departs at 7:30 pm and returns at 10:30 pm. All cruises board 30 minutes before sailing. Departs from the Inner Harbor on Light Street. Ticket Booth is located at 561 Light Street (between the new Visitor's Center and the Maryland Science Center) | Booth is open 9:00 am until 5:00 pm Mon through Fri | Sat and Sun hours begin at 10:00 am. Booth open till 7:00 pm on cruise nights. Appropriate attire is casual/business/dressy | No T-shirts, jeans, shorts or sneakers are allowed. Dress code is strictly enforced.